Sometimes it may be necessary for you to rearrange the furniture in your home whether it is temporary for a party or to make space for holiday decorations, or a more permanent move just to change up the arrangement of your living room. If your home is carpeted, then there will more than likely be an impression in the carpet left from the furniture. These indents are an eyesore in the carpet and they will never come out entirely themselves, you must take action to remove them. The following tips will help you safely remove furniture impressions from your carpet. The most effective way to remove furniture impressions is to create steam over the indent to help it regain its shape. The easiest way to create this effect with common household items is to use a damp cloth and an iron. Start by putting the damp cloth over the indent and heating the iron to medium setting. Once the iron is heated, place it on top of the cloth and check it after a few minutes. If the impression has mostly disappeared, you can fluff up the carpet fibers by hand to help fill it in. If the impression is still there, repeat the process. Do not use this method if your carpet is made from olefin fiber. Another way you can remove furniture impressions from your carpet is by using an ice cube. Simply put an ice cube in the indent and let it melt into the fibers. After the ice cube has melted, you can brush the carpet fibers back and forth with a toothbrush to fill in the impression. 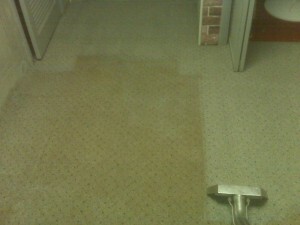 The carpet should be left to dry on its own after completing this process. If you are temporarily rearranging your furniture or rearranging it permanently to create a new look in your living room, chances are there will be indents left in your carpet. These furniture impressions are unsightly but they can be removed either with steam or with ice. 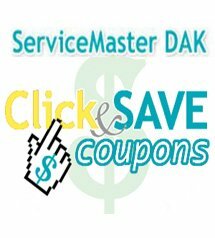 If you are not comfortable using these methods on your carpet, contact ServiceMaster DAK for assistance. Our carpet cleaning professionals can effectively remove furniture impressions using our steam cleaning equipment and we can also deep clean your carpet if needed. 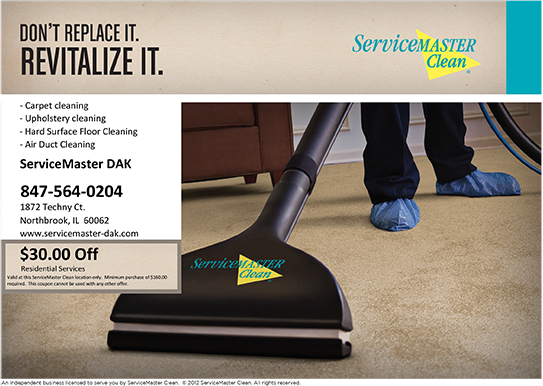 We can be reached at 847-564-0204 for more information about our carpet cleaning services.